One of the classic questions when buying vintage is how to pick something that is properly sized for your body. Vintage clothing is often quirky, because before the 1960s most clothing was custom-made by in-home sewers or dressmakers. That means that if a woman had a 38 inch bust and a 26 inch waist, the clothes were tailored to fit and flatter her. Slowly, starting around the late 1950s, Ready to Wear garments became more and more popular as the industry sizing was standardized. Today, we know ourselves by whether we're a size 2 or a size 12, but with most vintage before 1980, that kind of standard won't work. So it's important to know what your body measurements are and to look for clothing that is the right fit for your body size. 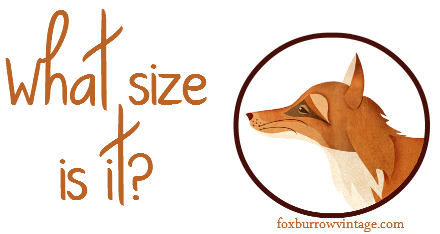 While Foxburrow Vintage does sell many Ready to Wear garments, possibly sized with modern sizing, it's still good to know your measurements and to allow for wiggle room, as sizing standards tend to change every 10 years or so. To ensure the best fit, use a cloth or flexible measuring tape and measure your body according to the measurement chart below. You may need to get a friend to measure certain areas. Once you do this, it's good to measure your body ever year or so to ensure your measurements don't change. Keep the measurements on hand for when you're vintage shopping and you'll know you're getting something that fits. The chart below is how Foxburrow Vintage measures garments. All measurements are taken with the garment lying flat for best accuracy. Please allow a little wiggle room - if your bust is 32 inches and the bust on the garment is 32 inches, chances are it's going to be too tight. A -- n e c k : Wrap the cloth measuring tape around the widest part of your neck. This is primarily a measurement useful for men's clothing but can also be necessary on high-collared women's dresses and coats. B -- s h o u l d e r . w i d t h : Measured between the shoulder blades, where the seam of the arms would be on a garment. C -- b u s t : Wrap the cloth measuring tape around the widest part of the bust, usually just under the armpits. D -- s l e e v e . i n s e a m : From the inside of the armpit to the inside of your wrist. E -- w a i s t : Wrap the cloth measuring tape around the narrowest part of your waist. This is usually much higher up than expected, so face a mirror when taking this measurement. F -- h i p : Wrap the cloth measuring tape around the widest part of your hips, usually just a few inches above the crotch. G -- s l e e v e . l e n g t h : From the middle, back of the neck to the inside of your wrist. H -- n e c k . t o . w a i s t : From the bottom of the neck to the waist. This is a useful measurement for petite sized clothing, which may have a shorter torso. s k i r t . l e n g t h : This is not mapped out on the chart, but is the length of the skirt from the waist to the bottom hem of the skirt. On a skirt and not a dress, it is the full length down the front of the skirt. g a r m e n t . l e n g t h : This is not mapped out on the chart, but is the full length of the garment. Taken from the shoulder to the hem of the item. Your place of work garments have got been subject to any serious change within the modern-day times and females are all ready to check their specialized waist cincher ideal inside their places of work. The chart only show that but you miss the Best Waist Cincher just check up.. Excellent analysis of Vintage Clothes for women and changing trend. Measurement aspects are helpful for designing garment for women. Awesome classic waist cincher has many benefits & impact on body. Can google it to know more. Excellent analysis of Vintage Clothes for women and changing trend. Measurement aspects are helpful for designing garment for women. Awesome classic waist cincher has many benefits & impact on body. Garments are something we as a whole need to purchase, yet it is not important to spend far too much on them. Here are some great approaches to hold your Garments spending under control. Just make sure the garments measurement & size before buy.